A large proportion of India’s rural population, particularly those living in remote areas, are not able to produce enough foodgrains to meet their food requirements. So they collect and cultivate a wide variety of wild plants for their nutritional and medicinal attributes. “Local communities relish a number of wild plants and they are part of our traditional food systems,” says Somyakanta Behera, a native of Sambalpur, Odisha. As I was travelling in Kendrapara district in the east coast of Odisha, I saw local women collecting leaves in already harvested paddy crop fields. Though the soil of this district is highly productive, it is still prone to cyclonic storms that result in flooding every monsoon. Salinity ingress as well as heavy rain water during monsoons results in crop failure and hence, only a single crop of paddy can be harvested every year. To combat the adverse climatic conditions and the consequent shortage of foodgrains and vegetables, local people in Kendrapara gather a variety of wild edible plants to sustain themselves for at least two to three months in a year. The particular weed that I observed being gathered by local women was growing in other moist and disturbed habitats that are frequently flooded such as river banks, coastal areas and paddy fields. It was February, and I saw women gathering tiny leaves in small baskets. When I enquired, I was told it is mutthi saag/mathi saag or a leafy edible that grows close to the soil. It is sour, but tastes great when cooked with potato and colocasia and can be enjoyed both with parboiled rice and chapatti. The leaves as well as the young shoots are roasted with mustard seeds and later brinjal can also be added. The botanical name of this plant is Polygonum plebeium and it belongs to the plant family of Polygonaceae. The plant grows as a common weed in moist places. Polygonum plebeium is native to much of South Asia. It is also found in other parts of the world such as Madagascar and Australia. In Nepal it is called as chemti saag or dubia saag. The plant is reported to be consumed in other states of India as well that includes Jharkhand, West Bengal, Haryana, Chhattisgarh and Madhya Pradesh. 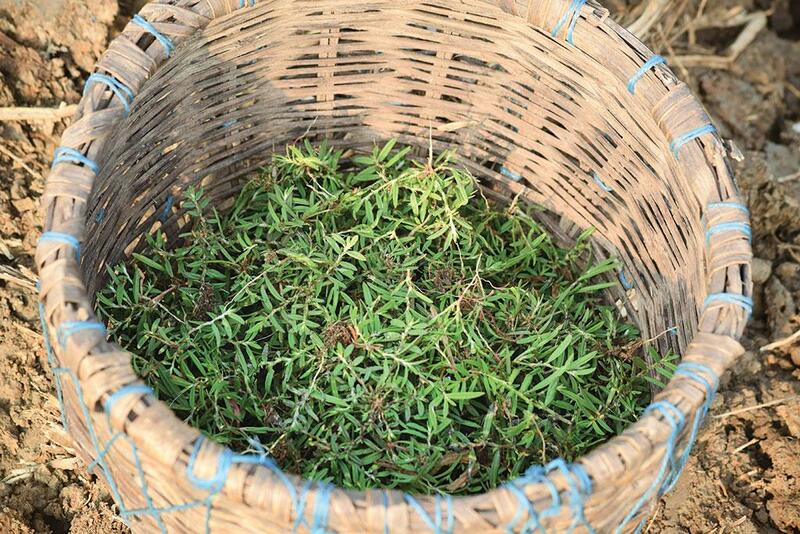 “There are many varieties of Polygonum and they are all consumed by local and indigenous people of Odisha,” says Muktipada Panda, who has worked as a researcher in the coastal part of Bhitarkanika, Odisha. I also saw the plant being sold in urban markets of Bhubaneswar, which indicates very strong cultural underpinnings of the use of wild edible herbs in everyday life. The plant contains high amount of vitamin C. A number of studies as well as phytochemical investigations for antioxidant and cytotoxic properties of the aerial parts of the plant have confirmed the presence of flavonoids, alkaloids, glycosides and carbohydrates that provide antioxidant and cytotoxic properties. The Department of Pharmacy at the University of Asia Pacific in Dhaka says Polygonum plebeium is a natural antioxidant. While the plant is reported to be used in the treatment of pneumonia, the rootstock is reported to be used to treat bowel complaints. The leaves and shoot ash along with oil is also used against eczema in many parts of Odisha and neighbouring states. There are reports that the plant is used as folk medicine in Pakistan—as a blood purifier and also to cure liver disorders like jaundice and hepatitis. Separate the delicate leaves from the twig and wash them properly to remove any soil particles. Chop the boiled potato and colocasia into medium sized pieces. Heat the oil in a wok. Add mustard seeds and let them crackle. Now add a pinch of asafoetida. Add broken and dried red chillies and fry till they turn brown. Add boiled potatoes, colocasia and muthhi saag leaves. Mix them properly and add salt to taste. Let it cook for 10-15 minutes. Once the leaves are cooked properly and tender, remove it from fire. Mutthi saag is ready and it can be served with parboiled rice or with rotis with some butter milk.